There are a few trends that were very recently considered outdated, making their way back on the agenda for marketing and communications in forms of print. For example printed newsletters, which had been mostly moved to digital for so long, are new again avoiding the internet noise and getting mailed directly to the targeted audience. This is a great way to communicate in the homes of your demographic in a manner they likely haven’t seen in quite some time. What is considered retro is making a jump to the mainstream and even serif fonts are getting dusted off to find their way back into the public eye. Once an easily identifiable look of the 80’s collateral, now trendy publications are embracing the font type as a way to look fresh and modern. Proving the printed word has not lost its edge, the client testimonial is one of the greatest ways to let your service speak for itself. Customer reviews or direct quotes reinforce your business’ quality of service. Putting great reviews on printed collateral will help to build trusting relationships with consumers. Print media is a vital part of a company’s marketing efforts. Come to Specialty Mailing to help with your next campaign! The Postal Regulatory Commission (PRC) has recently approved the United States Postal Service’s proposal to increase postage rates in 2019. Several other changes will occur when the new rates go into effect on January 22, 2019. The recent decision by the PRC has led advertisers to wonder how this will affect their marketing plans in the New Year. The USPS has decided to re-brand standard (bulk) mail by changing the name of the service to “Marketing Mail.” Prices will only increase by less than one percent for the newly branded Marketing Mail. 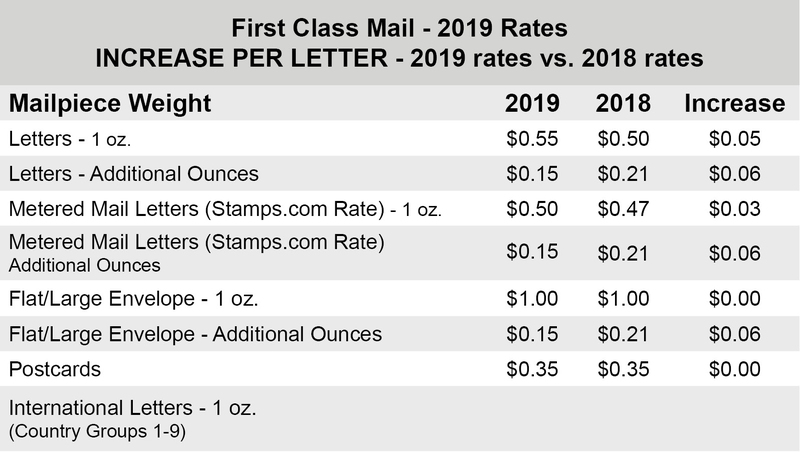 Mailers will also be happy to know that the USPS has increased the maximum weight for Standard Mail Machinable Letters from 3.3 ounces to 3.5 ounces and increased the weight breakpoint at which pound prices apply for Standard Mail flats from 3.3 ounces to 4.0 ounces. This will allow advertisers to add more pages or a heavier stock to their direct mail pieces at a slightly higher rate. If you have any questions regarding your mailings let us know we are here to help make your 2019 Mailing Campaigns a successful return on your investment. As you may be aware USPS has recently raised rates an average of 2.5%. As of January 27th 2019 the new rates went into effect. Attached are the rates. Please contact your representative at Specialty Mailing with any questions. Specialty Mailing is a full service lettershop that can take care of your organization’s mailing needs. We offer the latest technology in laser printing, inkjet addressing, folding, inserting, data management, and many other aspects of direct mail. We also provide the personal service you expect. We can process projects of any size, and focus on providing the quickest turnaround possible to help you reach your customers in a timely manner. When you call, you will speak with a live person, not a recording. We are available 24 hours a day, 7 days a week. Specialty Mailing is dedicated to saving you money while providing superior service. For your next mailing, please call us. Before any pumpkins or turkeys are carved and we’re all immersed in the shopping mania that is the holiday season, have you ensured that your company’s media plan is capitalizing on all the yuletide cheer? Setting up Christmas decorations in September may feel a bit overzealous but planning for the biggest shopping day of the year can never be too soon. Now is the time to plan the frequency of your direct mailers to ensure your company and product is part of the Black Friday market. Consider two to three couple direct mailer runs to draw consumer attention and for the most response. As long as your mailing lists are up to date and your company’s message is finding the right demographic, your campaign will achieve the required reach to gain results. Also, be sure your campaign’s design and color palettes are in-season. We don’t have dive headfirst into winter just yet, take time to embrace the warm colors of autumn before the leaves fall. Allow your designs to change with the season. With families across the country gearing up for another year of academia via back-to-school shopping, has your business done enough to grab the attention of potential shoppers? Adding coupons to your company’s consistent direct mail campaign could be just the motivation that customers need to walk through your doors. Coupons may mean an initial, discounted service, but may greatly increase traffic from both new and old customers while also adding to your overall sale totals. To grab the attention of your audience make sure the offers are simple by offering either percentage or large dollar off of purchasing. Coupons can also encourage the buyer to buy more to get more as long the incentive is easy to understand and attractive it will greatly improve the success of the campaign. Plan to mail to the same list more than one time for a consistent reminder to the buyer to take advantage of the sales you’re offering. Keep the campaign consistent in design with just slight changes to make the newest mailer fresh. The more buyers see the offer, the more likely they are to take action. Take advantage of the traffic as people come in and offer incentives to come back after the rush of the season. Coupons and printed incentives are a great way to measure the success of your advertising efforts. Contact Specialty to start planning your next direct mail campaign. Creating a successful marketing campaign is more than just a great idea at work, it’s also about thorough research of your target demographic. Simply put, understanding your audience and what drives them and their purchasing tendencies then putting that knowledge into action, yields higher results. A large audience made up of adults aged 54 to 73, Baby Boomers are generally considered most affluent and at a stage where their daily lives have more time freed up compared to the other generations. Such freedom, coupled with their background that predates the technological communication boom, means Baby Boomers have both more time to read and consider direct mailers, as well as a greater appreciation. Baby Boomers also tend to place a higher value on respect, and so by creating a direct mail campaign that employs this notion to its advantage, and by ensuring the piece is not just eye-catching but also extremely legible, this audience will be more engaged with your message and therefore more likely to act. Made up of adults ages 38 to 53, Generation X is primarily driven by a work + life balance and are making important and often long-term financial decisions for their families, as well as for themselves as individuals. Direct mail still has a powerful impact on this group as they are majorly focused on their families’ financial situation and direction, therefore many are looking for the best deal, competitive pricing and discounts that will provide them the most beneficial service/product for the least cost. 25 to 37-year-olds find themselves in the Millennials category. (This is somewhat of a cross between Generation Y and a portion of Generation X.) Just as with Generation X, many are making financial decisions for their families however, drivers for Millennials tend to be centralized around transparency and authenticity. This group is generally more concerned with social awareness and have a higher emotional drive in terms of their consumer practices. Incentives in your marketing campaign directed at this demographic that include guarantees, support of a cause, and a message that resonates on an emotional level with them, will have a greater impact and entice a stronger response. Lastly, though Generation Z may be made up of the youngest group of individuals from about 18 to 25 years old, they are also coming in strong as a large consumer base for services and product sales across the nation. While studies are still being conducted to determine the spending and buying habits of this group, it is clear some drivers for Generation Z include control, freedom, and technology. Often referred to as the “iGeneration”, Generation Z is largely centralized around technological communication, however direct mail still provides an impact. 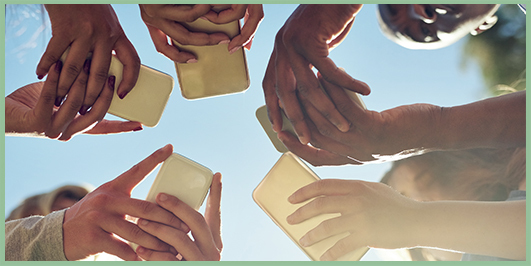 Beyond brand awareness, the message is key and having a tangible connection to this audience may prove more personal, which offers something a screen does not. Is your business using direct mail to the best of its potential? If you want to get the most out of your next direct mail campaign, be sure to include these three methods to boost consumer response and get more customers in your store! Shoppers love savings! Having the right offers on popular services, discounts on items, or even giveaways, can be a great motivator to bring more traffic to your business. Whether the offer is dollars off your prices or percentage off your prices, tracking what works over time will help you gain knowledge into the buying behavior of your clientele and what works best for your business. Having a great message is just the start, reaching your target audience is the next step to your campaigns success. Your mailing list needs to be comprised of potential clientele that fit your demographic. Knowing the area that your business covers, along with consumer lifestyle habits, will help determine who should receive your campaign. Through a mailing list you can drill down to location, age range, and income and capitalize on reaching the right consumer in your area. Maintaining brand awareness across all platforms is crucial. Your website, social media sites, and email lists, can be indispensable tools when reminding customers about special offers or keeping them up-to-date on company news. Give shoppers a reason to come back by frequently updating your sites with relevant information about your industry. On the printed direct mail piece, try providing an attractive giveaways to the mix for example tickets to a sports game or local attractions, that will encourage consumers to sign up to win and opt into your email database or to follow you online to help build those connections on all platforms. Consider these factors when building your next campaign. Contact Specialty Mailing to learn more about mailing list, driving online traffic, and getting your mailers in the right homes! PAPER: Selecting the right stock can be a great way to make your campaign stand out. Glossy stocks will add more appeal to photographs in your direct mailer, while matte finishes create a more understated and classic look. A more recent material, “soft touch,” is a laminate that has a soft and smooth suede feeling when in hand. Added textures bring a whole new dimension to your mailer, keeping your ad one step ahead of the competition. FONTS: Typography is imperative to highlight key points and draw consumer attention. Recent trends show script and hand written type fonts are becoming increasingly popular in consumer campaigns. “Moonlight Serenade” and “Thirsty Script” may be prime candidates for your next direct mail piece. COLOR: Temperature will influence consumer perception of your ad. Clean and earthly color palettes can convey a peaceful and holistic message, blues can be seen as traditional and technical, while reds are typically chosen to stand out and represent energy and joy. Matching the right colors to the mood and tone of your brand will give consumers a much deeper understanding of your product’s image. With the holiday season in full effect, it's a great time look back at this years efforts and plan for even bigger direct mail media campaigns in the up and coming year. Sales trends will indicate what items and services to push depending on the time of year there was an increase or decline. Try planning for quarterly advertising and analysis throughout the year based on these sales trends to help keep the campaigns fresh and on target. Your company can then capitalize on the most opportune times for a product and service in order to garner the largest amount of consumer interaction. A quarterly schedule will also help relate content to seasonal occasions to keep in tune with the consumer and will greatly improve your chances of creating awareness and increasing sales. For best practices, considering distribution times in your planning and staying ahead of large holidays and annual events that will occur throughout the year which will yield the best results! 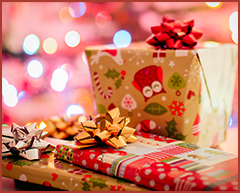 From all of us at Specialty Mailing, we wish you a Holiday Season full of cheer and a very happy and prosperous New Year!